Being one with a creative bent, I had an asymmetrical haircut in college and have always enjoyed working with my hands: sewing, making paper, painting walls insane colors simply because they were walls and could be painted. After twenty years of office work -- primarily non-profits in an organizational and administrative capacity -- I intentionally switched gears and began learning how to manipulate metal and glass into artful forms. The catalyst for my decision: The realization that art is a valid pursuit unto itself. With an intention to create primarily functional pieces, I attended the welding program at Austin Community College. I’d never before been exposed to a metalworking environment. Creating art allows me to engage both mentally and physically. I’m delighted to work with my hands to physically manifest my sculptural visions. I look forward to what the future holds for me creatively. ​My studio is at the water's edge in Austin, Texas. I exhibit in galleries and accept commissions. I collaborate with clients from the initial design phase through creation and installation. 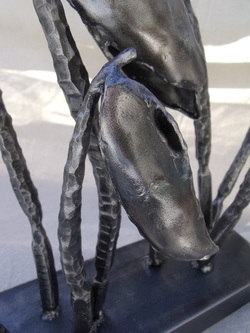 I hold Art Metals and Metal Sculpture certificates from Austin Community College in Austin, TX. I'm a member of ABANA, the Artist-Blacksmith's Association of North America, and a former board member of Balcones Forge, a Central Texas-based affiliate of ABANA.